A couple of weeks ago, on a post about blueberry blossoms, a reader commented on their similarity to the fruit. A little chime went off in my artist brain, and I did a series of sketches based on this idea. What I finally came up with alludes to the flower and fruit without precision; I chose yellow for the bell shape, as a contrast to the purple, which is closer to the hue of grape than blueberry; the ripply flourish at the blossom's opening is gone for simplicity's sake. 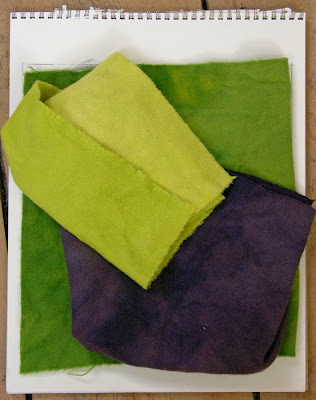 When I work on a sketch for a ruglet, I keep my dye sample book in front of me as an aid for color mixing; by checking the available dyes, I have a better idea of colors I will need. 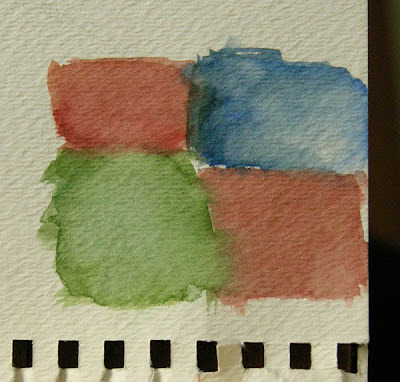 The pencil notes you see under the watercolor remind me which dyes I plan to use. I dip dyed the end of the yellow wool into light green so I can give the bell form a slight sense of volume; the change will be very subtle. The purple wool has a nice variegated color range, created by crowding the wool in the dyepot so the dye doesn't reach all the material evenly; I love the color shifts that come from hand dyeing, which gives the work a quivering uncertainty, more lively than flat hues. 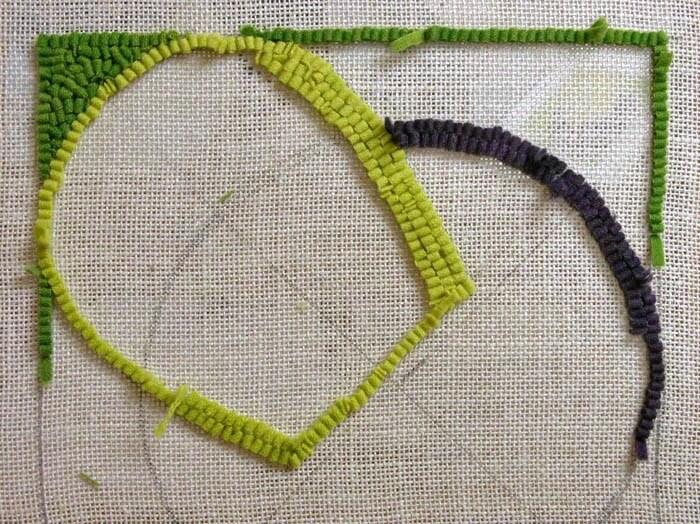 I think these three colors are quite gorgeous together, and hope they look as good when hooked. 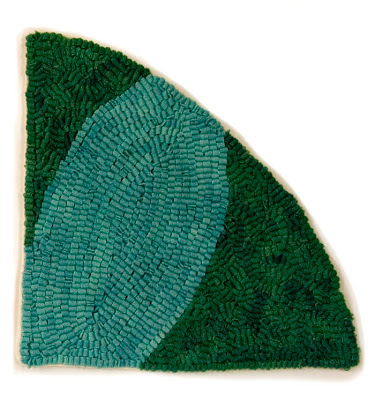 The hooking patterns for this piece, which is 10 inches square, are: following the outlines on bell and circle, and random for the green background. As the weather is a bit cooler, (we've had a lot of much warmer than normal temperatures), I can enjoy sitting and working with wool on my lap. The rhubarb plant is a magnificent specimen, with enormous ruffly leaves hiding a brilliant treasure. When I moved to this house, there was some rhubarb growing next to the stone wall in the backyard; it was an old fashioned variety, with very sour green stalks. 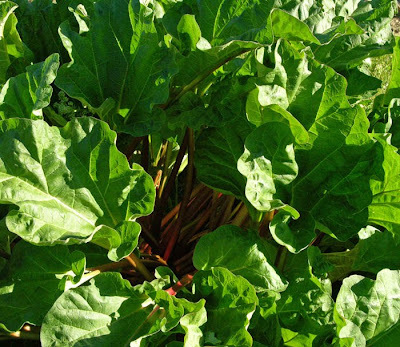 I planted this red rhubarb, which in addition to making pretty sauces, pies and jam, is a bit less tart. 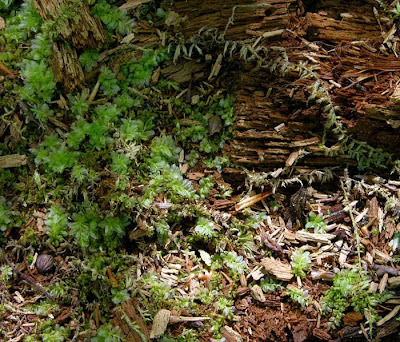 Its location alongside the compost pile is perfect for a big, hungry plant. Rhubarb stalks, which are classed as a vegetable but we think of as a fruit, are the only edible part of the plant. The sweet/tart flavor of rhubarb desserts isn't for everyone, but if you love rhubarb as I do, then making jam is an essential rite of the season. Layer rhubarb and sugar in a large bowl and let sit overnight. 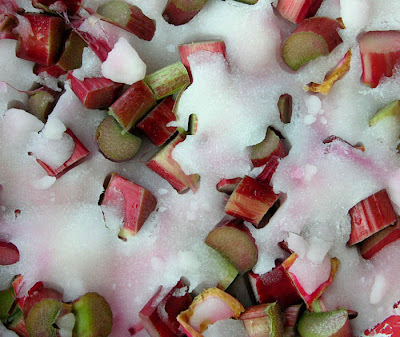 Above is a photo of the sugar beginning to draw the juice from the rhubarb the next morning, the bits of fruit looking like jewels strewn in icy snow. 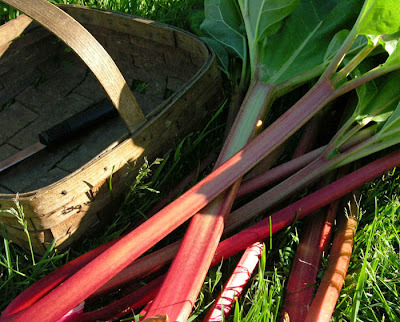 Put the rhubarb sugar mixture in a large pot (I use stainless), bring to a boil, then cook at a rolling boil till thick, about 1 hour. Since I've made a lot of jam, I can tell when it's thick enough to set. I don't find candy thermometers useful, but a good method is the refrigerator test: put a bit of jam on a plate and put in the freezer for 5 minutes; if it sets, it is ready. Put into pint jars and process in a boiling water bath for 15 minutes. If you are without a canner, I think freezing would also work. 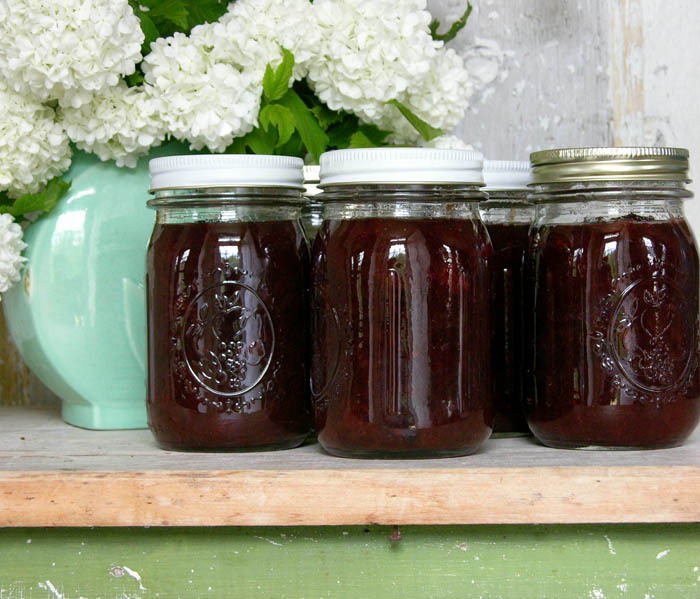 The recipe makes about 5 pints of delicious ruby-red jam. This is the view from the Roy farm, a few miles from my home. 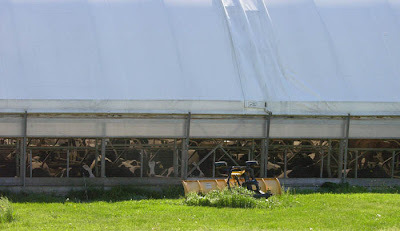 It is one of my favorite places to visit to hunt images for my paintings: because it's a large working dairy farm, there's always a lot of equipment parked, and it is in such a beautiful spot that it is a pleasure to walk around. 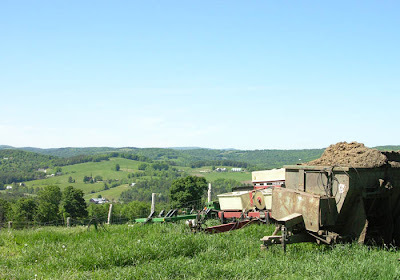 In this area of Vermont, there are many farms such as this one, with rich fields on the tops of hills, providing grand views out towards a working landscape. I realize I must seem rather perverse, focusing on machinery rather than the expansive views; I began with landscape, but over time, with my developing interest in abstraction, I zoomed in on equipment. 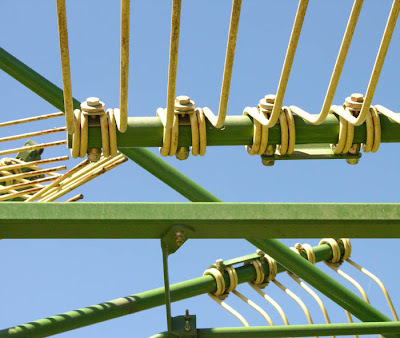 I have written about this change in a couple of posts: "At a Point in Time, Change" and "Contemporary Agriculture". 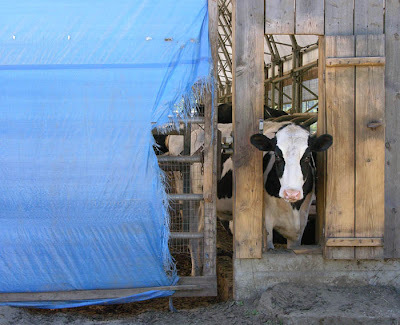 Cows are wonderfully curious creatures, giving you a sense as they follow you, that they are ready to communicate, somehow. 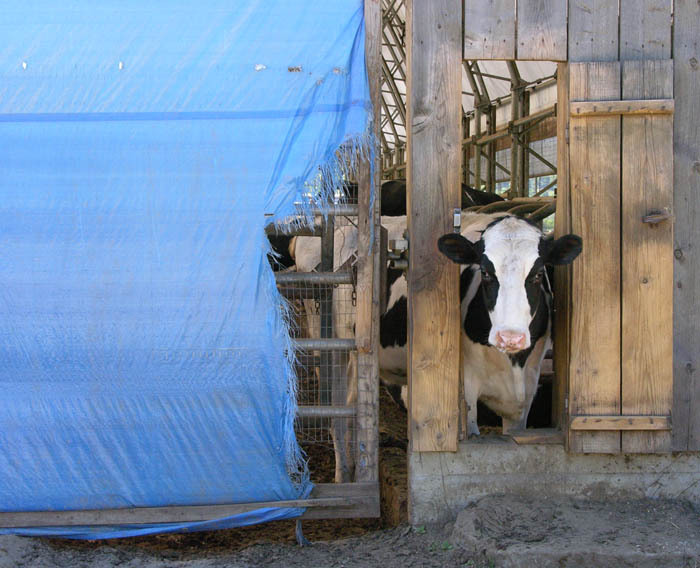 At the Roy farm, the animals are kept in a free stall hoop barn, a modern, more economical, structure in the shape of a giant quonset hut. Below are two of the fifteen or so images that I gleaned yesterday from the farm, very different from each other. 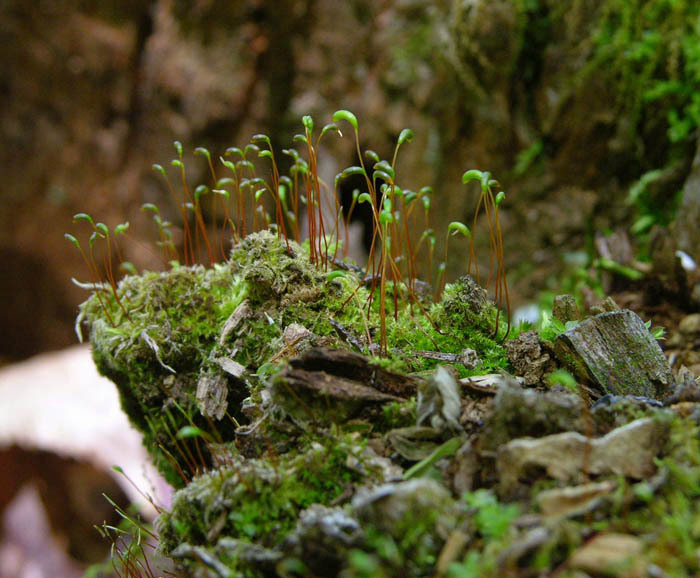 Finding compositions is something similar to noticing small things in the woods or garden: opening the eye and mind. Some of the perennial herbs that I grow, either in the border or vegetable garden, add more than flavor to cooking; they are also beautiful plants, especially when they are flowering. 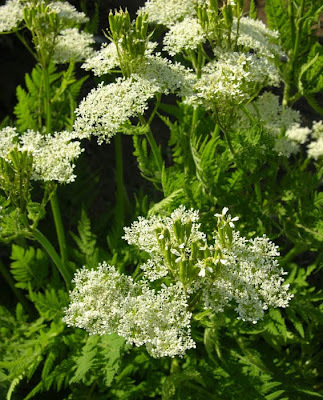 Above is Sweet Cicely, with soft, finely cut, licorice flavored leaves, and delicate white flower clusters, with elongated green seed pods rising above them. 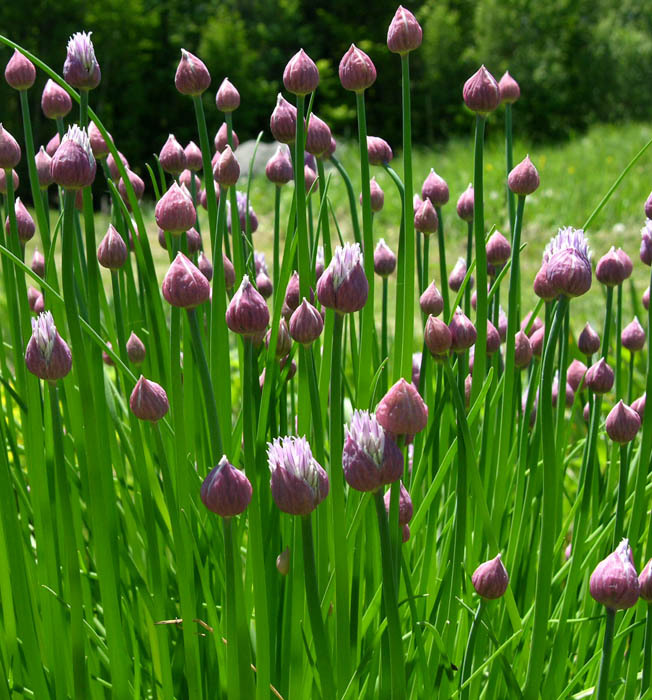 Chives have a very decorative flower; I'm very fond of the early stage of their growth, when the bulbous pointed shape of the buds are pregnant exclamations gracing the tubular foliage. 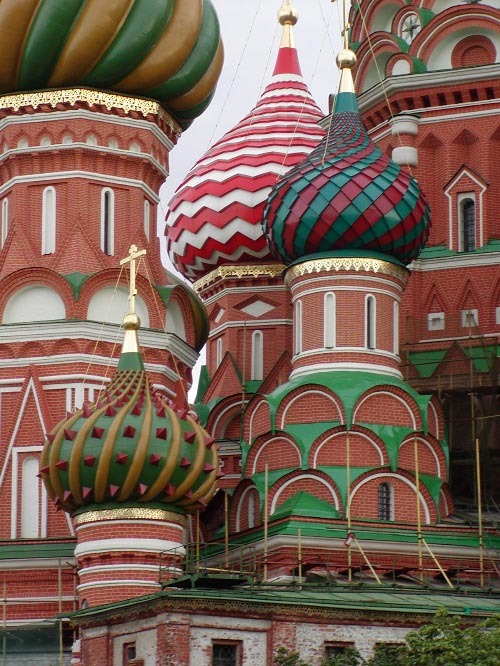 The form makes me think that the onion dome, familiar to Russian Orthodox church architecture, was based on the flower rather than the vegetable. It certainly has inspired some marvelously fanciful structures. 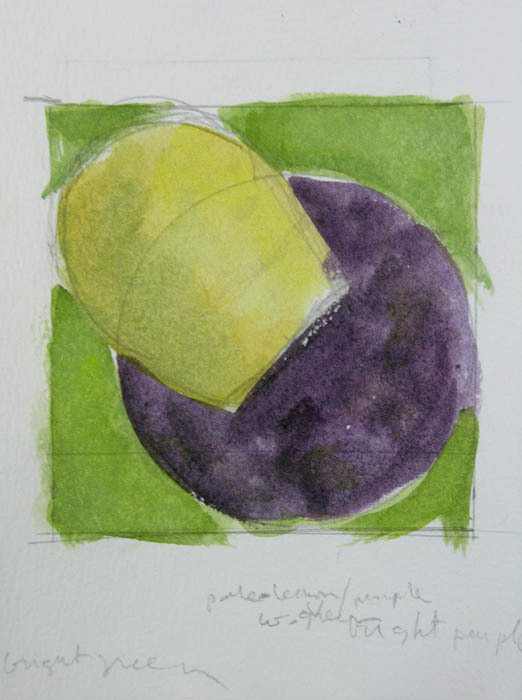 While working on this painting, and thinking about it in relation to Five Circles, another composition using flat forms, I wondered if all images of this sort would look like a face. 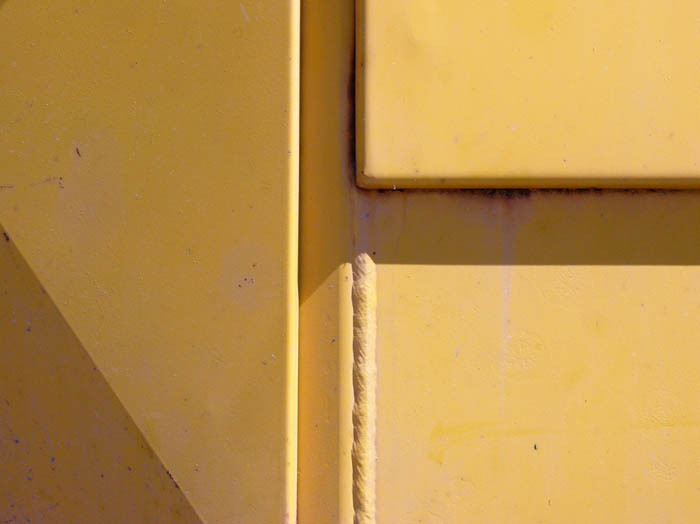 The openings, the bolts, the large empty plane: as humans, can we avoid this association? 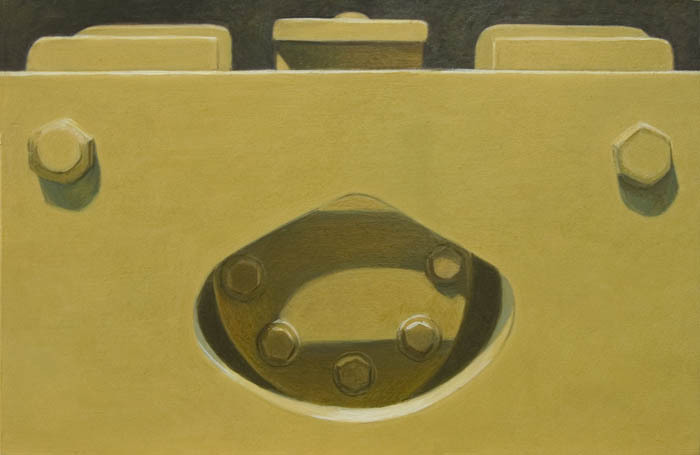 At any rate, I like the straightforward shapes in this work, their relationships, and the balance of light and dark; it's serious and funny, as though trying to keep a straight face (sorry for that, I couldn't resist). 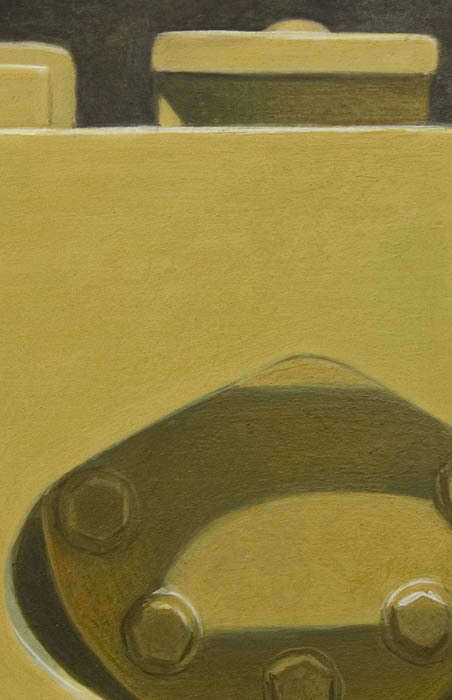 Here is a detail, so you can see something of the paint. 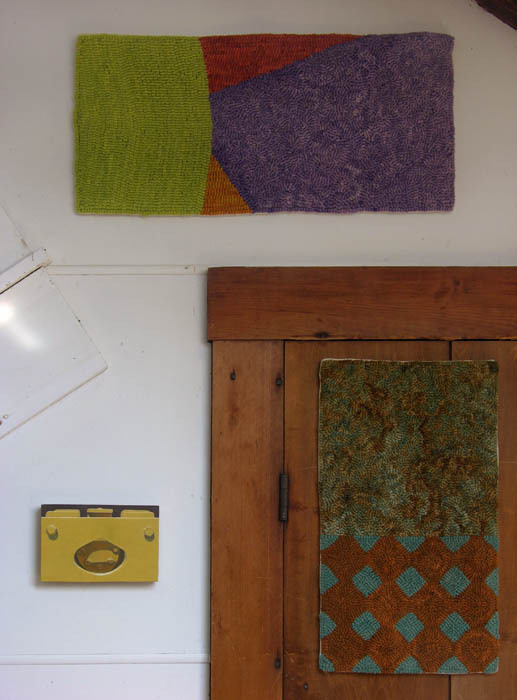 And below, to give a sense of scale, is the painting hung in my upstairs study/studio/tv room, alongside two ruglets: Tiles (17 x 10 inches) to the right and Purple Push (10 x 21 inches) above. Lilacs are so wonderful that I wanted to stretch out the bloom season, so I planted varieties that flower later than the common lilac. 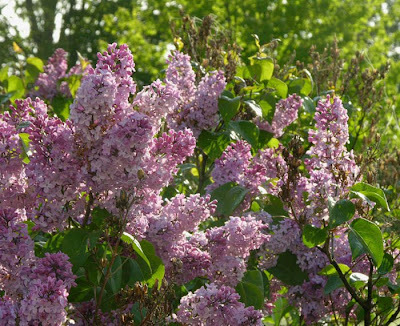 At the corner of the barn is a hybrid lilac Ludwig Spaeth, which has very large spires of a deep red-purple, quite dramatic from a distance. I also have a Korean lilac Miss Kim, which blooms later in the season and has a powerful sweet fragrance. 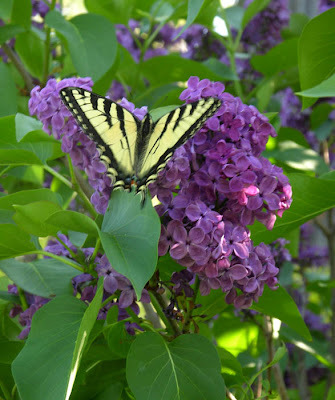 Even though the flowers aren't as richly scented as the common variety, the swallowtail butterflies seem to love them. I watched these lovely insects float from flower to flower, sipping from their centers. 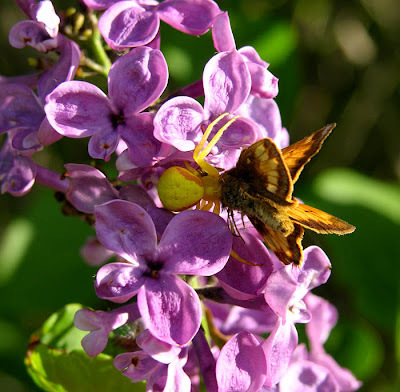 Then I noticed an amazing thing: there was a small butterfly or moth, not moving off when I came near, so I looked more closely; holding it to the spot was a brilliant lemon yellow spider, its body an illustration of how the color "lemon" calls up the sour fruit. Looking at the colors of yellow and violet and orange, I could almost overlook the story of predator and prey and sink into pure aesthetic pleasure. Here is the completed Lunette; I like its color and composition, though I regret that it doesn't look as symmetrical in its outer curves as I would have liked. As I've mentioned before, the process of rug hooking, especially the dyeing of fabric, is full of surprises, and less amenable to complete control than painting is for me, which I see as a plus. 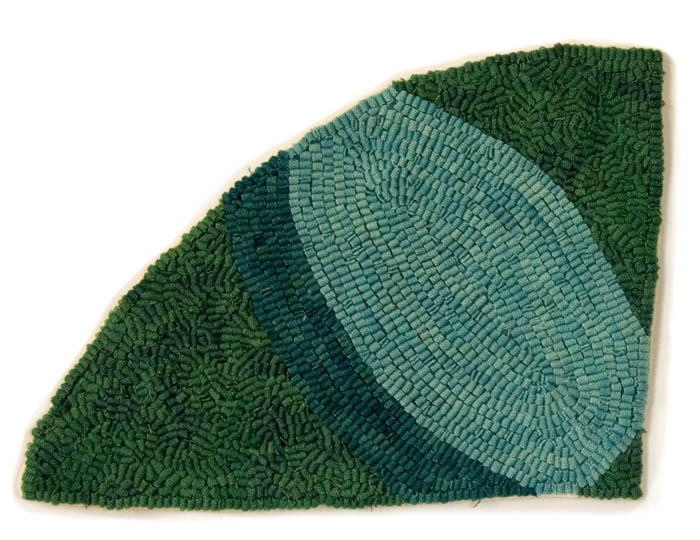 I've included photos of each panel separately so that you can see the color variations and hooking more clearly. 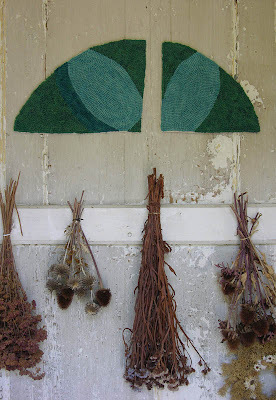 After photographing the piece, I looked around the house to find a good spot to see it in a context; the wall above a railing displaying dried herbs and flowers in my tiny front hall seemed a perfect place, where the allusion to a transom faces an actual one, curve to rectangle. 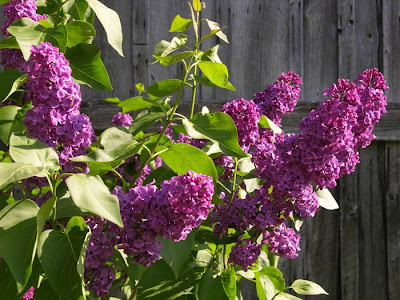 I became aware of the newly blooming lilacs by smell before I'd quite noticed the flowers; when I was outside late last week, their characteristic sweet scent floated in the air, making it delightful to simply breathe. The perfume wafted into my bedroom from the blooms right outside my second floor window, where I took the photograph above. 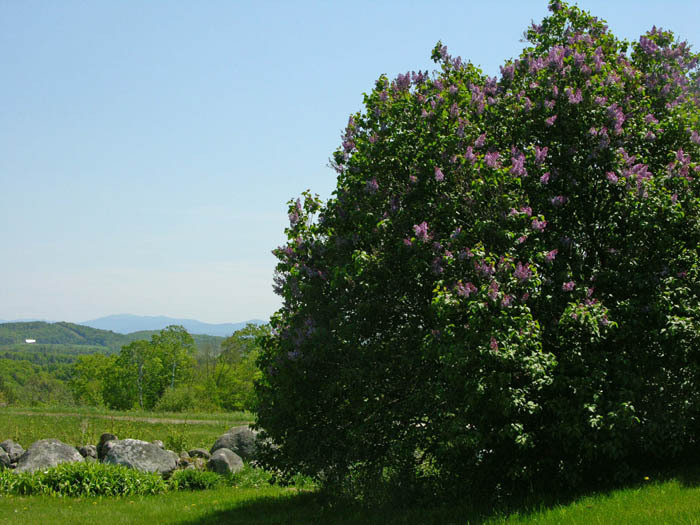 This is the lilac alongside my house, with a view of the White Mountains of New Hampshire in the distance. It is a huge shrub, and has been getting bigger and bigger over the years. Along with a few flowers, the lilac is the only growing thing that was bequeathed to me by the previous owners of my house, Vermonters mistrustful of trees near structures. Every once in a while, looking at the empty interior of the lilac, I am tempted to have it severely cut back and let it renew itself; I can see from stumps at its center that this was done before. But then I don't know if I could live without this plant during the years it will take for it to grow back. 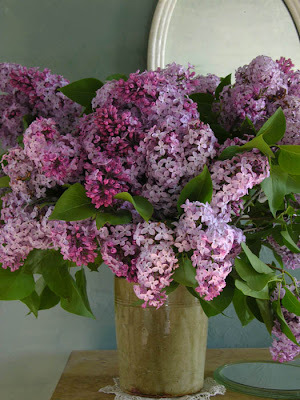 During lilac season, I love having large vases full of lilacs in the house. Each time I walk through the door, I can smell their perfume. There is a small bunch of flowers on my desk, making my work at the computer light and sweet. This morning, when I woke up and looked out the window at the vegetable garden, I could see something was amiss. 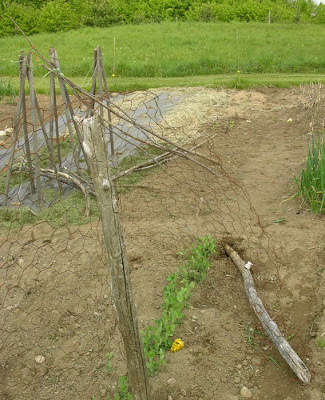 The tall teepees I'd put up yesterday for pole beans were knocked over, as was the end of the pea fence above. 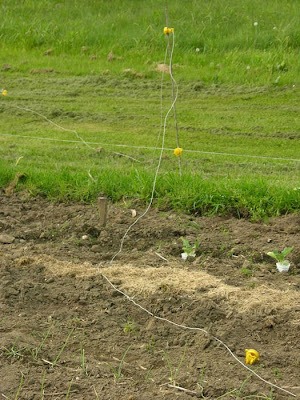 I could see that some of the electric fence wire was down, with the bright yellow plastic insulators scattered on the ground. The only thing that could have caused this mess was a moose tramping through the garden. 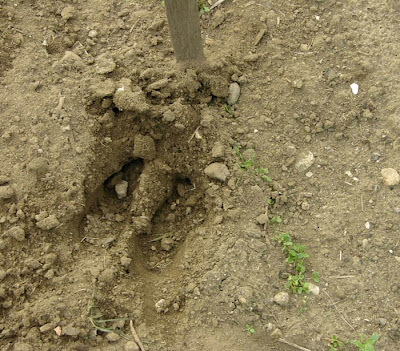 And sure enough, there were the large tracks, beginning in the asparagus bed; she then knocked down the bean poles, the pea fence, and walked through other rows; above, the five inch track is alongside the little bok choi plants. She exited the garden on its southern side, continuing on to the pond, which was probably her destination all along, taking a short cut through my vegetables. Moose are not like deer, frightened of the electricity in the fence; they don't seem to mind dragging electric fence wire across a field, being stung in the process. Nothing much at all frightens them, which is not surprising, considering how large they are. One good thing about moose is that even though I've had this happen a couple of times before, the moose has never actually caused too much damage, aside from having to replace toppled poles and rewire the electric fence. So far, as opposed to deer, they don't stay to graze in the garden. Lucky me. 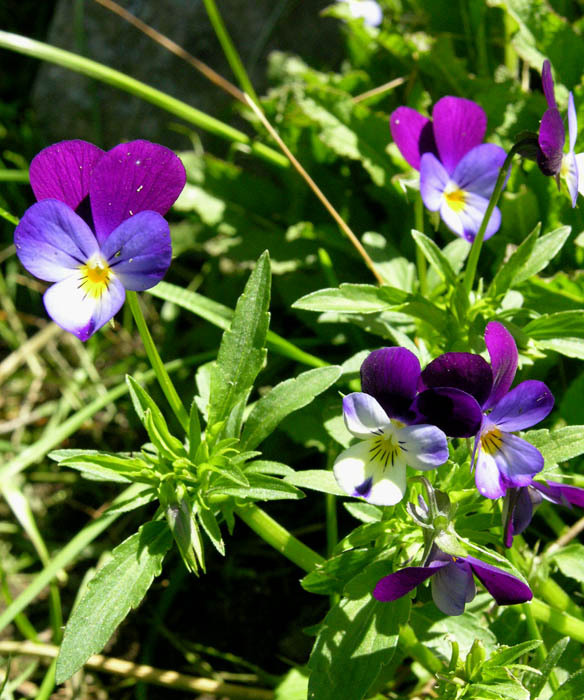 Some lovely little flowers have appeared on the forest floor, adding more visual pleasure to my walks. 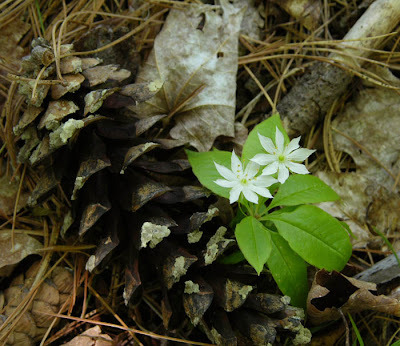 I believe the flower above is called Starflower, Trientalis borealis. With its graceful pointed petals and delicate stamens and pistils, it's a tiny grace note nestled alongside fallen cones and needles. 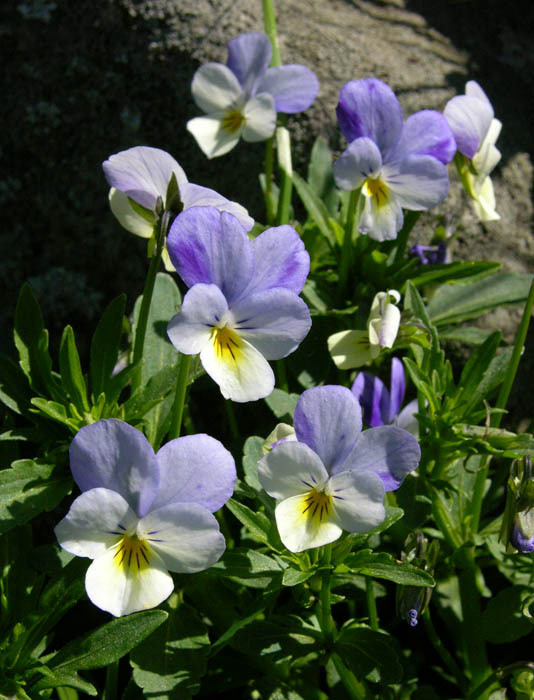 This flower is a bit larger, with four perfect petals rising above a quartet of leaves. I wasn't able to identify this plant in my wildflower book; I'm almost tempted to think the flower is actually a bract, because in its earlier stage it is a pale green. This flower was a real treat for me to notice and identify. 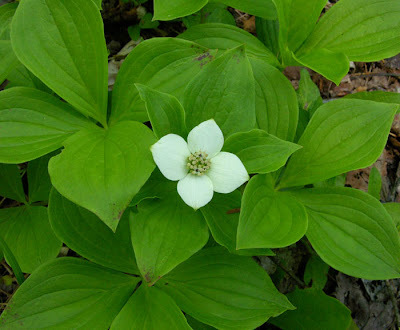 On my walk today the woods had a lovely scent, a sweet smell of growth and moisture. At a place where the air smelled especially delightful, I looked around to see what could be the source. There were quite a few of these frothy little flowers, so I picked one and smelled it, and yes, it was wonderful. 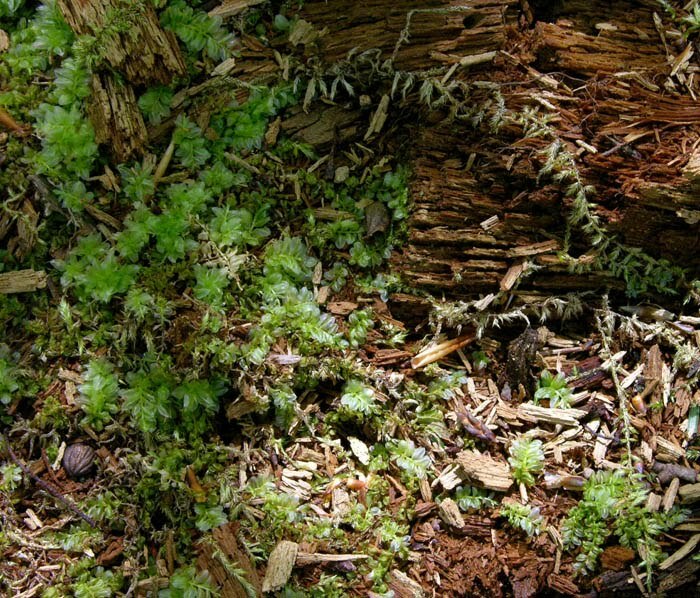 Being without a camera, I brought a few home to photograph and try to identify. 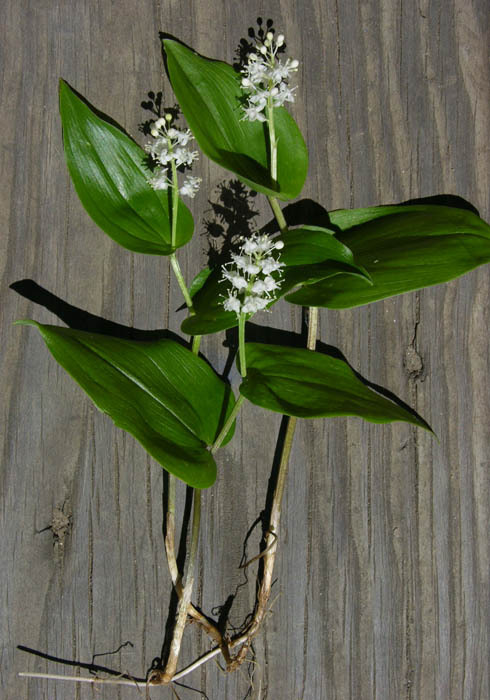 I was excited to discover, if my identification is correct, that this is a Wild Lily of the Valley, or Canada Mayflower, Maianthemum canedense. 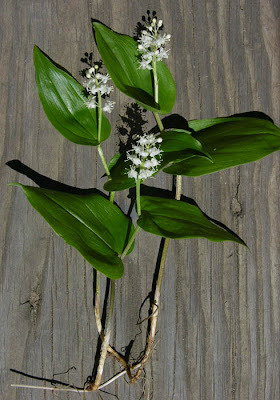 Since true Lily of the Valley is one of my favorite flowers, I will have a spot in my heart for these sweet woods blooms. Yesterday and today were perfect spring days; today especially was like a lovely day in June, with clear skies, temperature in the mid 70s, a light breeze, and happily even the black flies weren't bad. 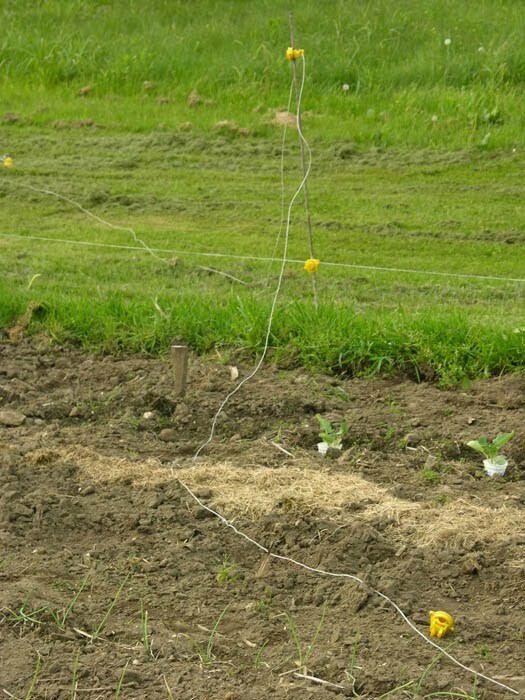 It was impossible to stay indoors, so I was very busy in the garden, preparing the ground for planting warm weather crops. Perhaps because I am thinking so much of new growth, and of fertilizing the soil, using the compost which I've made from decomposed kitchen scraps and plant material, when I went for my daily woods walk, I was very interested in a couple of rotting tree stumps rich with mosses, lichens and ferns. 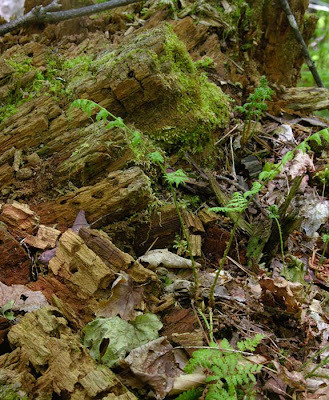 The wood was a beautiful rich red-brown and was beginning to crumble into small particles, seeming to be on its way to becoming soil. There is a constant movement in the woods of new life––small trees and plants and wildflowers––being fed by the decay of leaves and needles and trees. Walking on the soft paths, I am aware of the years of dead leaves under my feet, slowly rotting and feeding the soil. It is a beautiful system, a circle of life and death. 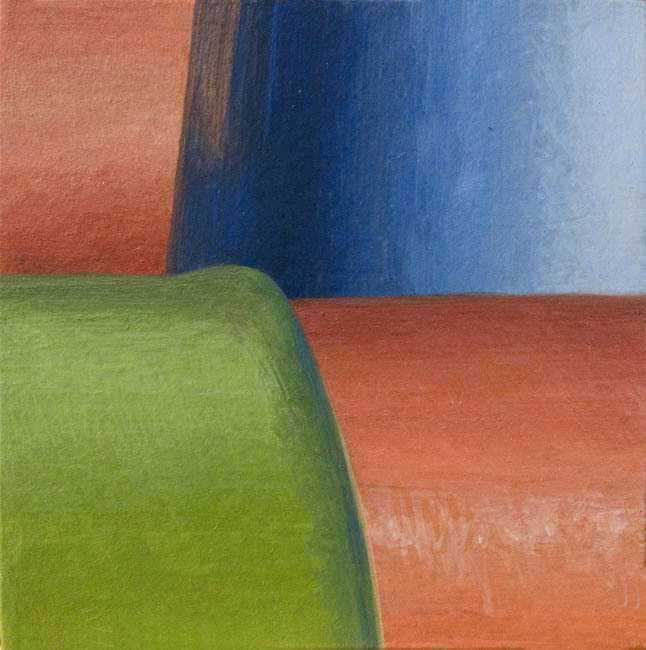 A friend recently pointed out to me that in most of my paintings, curved forms predominate. I realize that is quite true; my subjects––farm machinery––often have curved volumes: covered with belts, filled with liquids, used for Archimedes screws which move chopped hay. I find these volumes very satisfying, and enjoy working to get the illusion of solidity in the paintings. 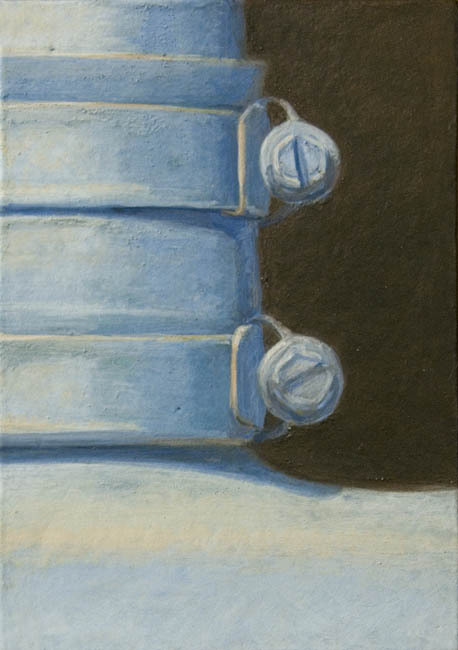 These two paintings are very small works, perhaps smaller than the image displayed on your screen. This painting, with its dark background, reminds me of Spanish still life painting, such as the work of Luis Melendez, which I wrote about here. It's fun to be using an ancient technique to depict contemporary implements. 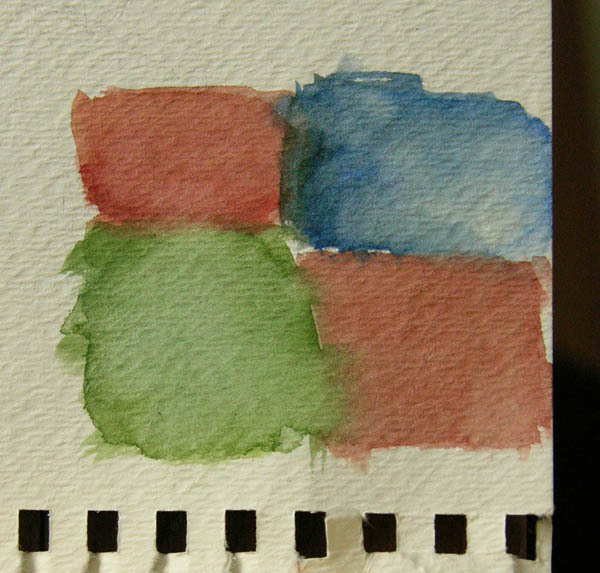 Below are two small watercolor sketches that I painted to work out the color for the paintings; I chose not to use the original colors, which were very intense and acid. In Green Red Blue, the blue was originally black. Doing the sketches was very helpful; I think I will use opaque gouache, more similar to tempera, in future. 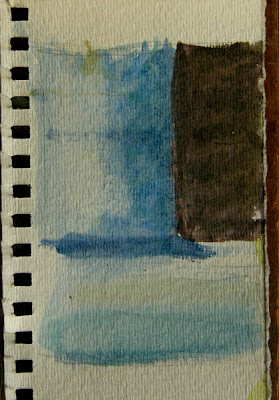 My next painting, just begun, is flat. 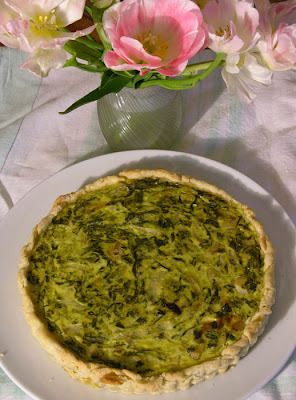 If you enjoy the lemony flavor of sorrel, this tart is a real treat. It is another sorrel recipe from Deborah Madison's The Greens Cookbook; I recently posted her recipe for Potato-Sorrel soup, which you can find here. I am a great fan of sorrel; not only is it an easy to grow perennial herb, it is delicious in soup cold and hot, and in this tart. For those of you who don't like to make pie crusts, I suppose you could use a ready-made shell. This recipe is for a 9 inch tart or pie; it may look complicated, but it really is quite simple. Combine flour and salt in a bowl, then add butter and shortening. Cut flour and fat together with fingers, knives, or old-fashioned kitchen tool, which is what I use. Add cold water, gently tossing with fingers, adding a bit more if needed to hold dough together. Gather into a ball, flatten into a disk and cover with waxed paper. Let rest in refrigerator for 1/2 hour. Roll dough and place in pan, leaving an inch overlap; fold it under, leaving dough 1/4 inch or so above the edge of the tart pan. Partially pre-bake the crust by first freezing the empty shell till firm, then baking in a 425 degree oven for 8 to 10 minutes till just beginning to color. Melt 3 Tbs butter in a wide pan. Add onion and salt; cover and stew slowly till onion is very soft. Melt remaining tablespoon of butter and add the sorrel by large handfuls; it will cook down to nearly nothing after 3 or 4 minutes. Whisk eggs with cream, then stir in onion sorrel mixture and half the cheese. Taste for salt and add freshly ground pepper. Scatter remaining cheese over the crust, then pour the filling on top. Bake until custard is set and well colored, about 35 to 40 minutes. Paintings look quite different on a clean white wall than they do in the more informal setting of kitchen or living room. 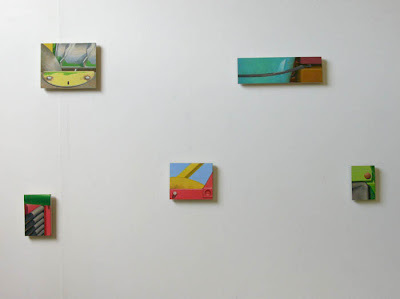 I was curious how these recent paintings would look in my large studio, so I spackled (badly) and painted a section of scuffed and pushpin-holed wall, then hung the five works in an all-over pattern. I like the way they look on white and feel that they hold the space fairly well. Matter of fact, I'd like to see them spread out in a line across the wall, each with a good amount of breathing space around it. Below you can see the paintings on vellum hung with earlier works on gessoed panels, and above them, three multi-part hooked ruglets. 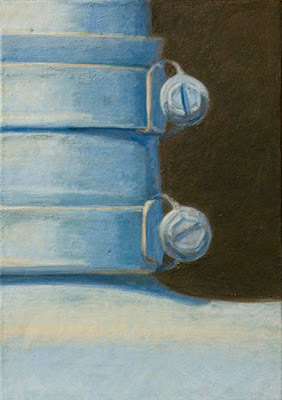 The tiny paintings seem very tiny here, but they do have a enough of a physical presence to have a voice in the crowd. These little flowers––which I sometimes think of as weeds, yanking them up when they get too prolific––are an introduced European wildflower, also known as Heartsease, species Viola tricolor. I shouldn't be cranky about them popping up everywhere because they are delightfully cheerful blooms at this time of year. 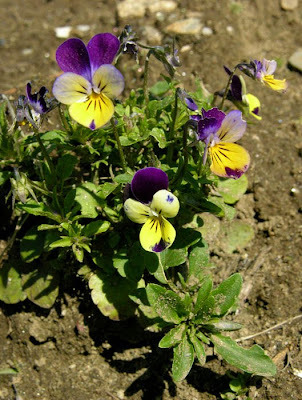 It is also fun to see the color variations from plant to plant, some with pale frosty petals, their small jottings radiating from the yellow center showing clearly; others have petals that are a deep red-violet, contrasting with lighter violet or with clear yellow. Each flower is distinctive in its markings and color, a unique face in the crowd. 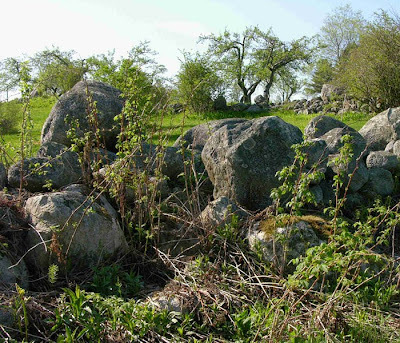 I have been plugging away at an endless garden chore: clearing the small trees and brambles that grow up in the stone walls surrounding my back yard. 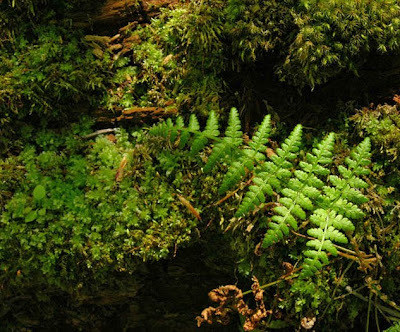 The constant reappearance of what to me are weeds are more evidence of the insistence of natural growth. I long ago gave up on keeping other walls around my property clear of trees, and now, 20 years later, the wall along the southern boundary of my property can hardly be seen. 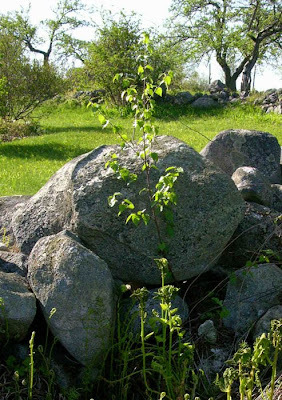 We could say, with Robert Frost, "Something there is that doesn't love a wall,.."
The stones of various sizes, mostly granite, weren't piled up into walls for decorative reasons; making walls of the large stones that kept rising up in the fields was a convenient way of dealing with them in the early days of farming in New England: making a boundary fence and clearing a field at the same time. Below you see a pile, not a wall, of stones in the middle of one of my fields. A few years ago I had someone with a small excavator dig up the large stones that dotted the ground and caused havoc to the brushhog he used to mow the field; I have this done every couple of years so that fecund nature doesn't grow up and ruin my view. 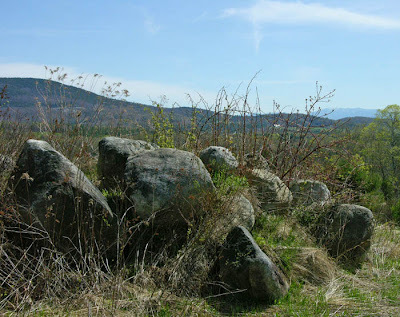 Locally, a field with a lot of rocks in it is called "boney"; my boney field is now cleared of rocks, for now. As you can see, the pile is already covered with growth, and the field will grow rocks again, as the frost, year by year, lifts them up above the ground. A New Painting: "Yellow Plate"